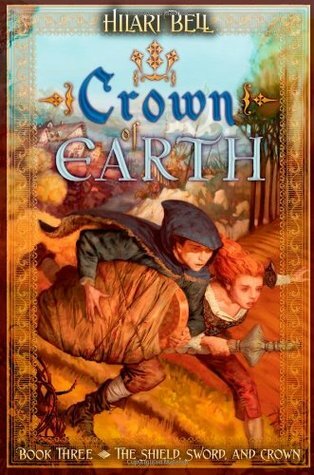 Prince Edoran races across the countryside to save his friend Weasel, who has been kidnapped by traitors to the crown. Joined by the fiery Arisa, Edoran faces cruel bandits, pirates, and mysterious priests, as they search for any trace of their friend Weasel. As he comes to terms with his own inadequacies, Edoran finds that the life of the common people, working for a daily meal, and living in a community all speak to his heart in a new way. In the midst of the political struggle for the magical Sword and Shield, Edoran and his friends discover the true nature of the magic bequeathed with those royal symbols. I LOVE this ending!!! Such a good ending to the trilogy, and all those loose ends came together wonderfully. The big reveal is the true meaning of the Sword and Shield, and how they work together with the Crown. I was so surprised and happy and delighted with that plot twist! I adored reading from Edoran’s point of view. He is so obtuse about some things, but I loved seeing him grow and change and become a better person. He has an excellent character arc through all the books, but being able to get really deep into his character in this book was wonderful! The world-building is so rich and complex, and the plot keeps things moving with lots of action and mystery. I absolutely love the magic system with the Arcanara cards and fortune-telling! It adds such a funny and mysterious aspect to the plot. Once again, the friendship between Weasel, Arisa, and Edoran is the star of the show! I loved seeing those three bonding and working together, and fighting and getting annoyed with each other, and crying on each other’s shoulders and sacrificing for one another. There is some deep true friendship going on in here! Their relationships felt so real and honest, and I devoured every chapter. Not a particle of romance in sight, and I loved it. Now I want to pick up more books by this author!